My good friend Diane Dwyer has a 3 year old nephew named James. 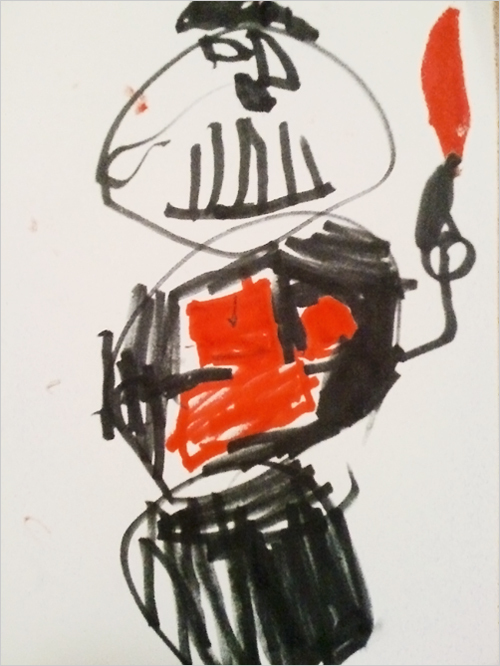 At the moment, James is obsessed with two things: snowmen, and Darth Vader. PREVIOUSLY IN AWESOME KIDS’ DRAWINGS: young Jeff tackles the Transformers. Christmas in July: The Worst Holiday Special Ever, Star Wars Style! Back in the 1970′s someone talked George Lucas and the poor actors of Star Wars into doing a The Star Wars Holiday Special. I saw this on a cold December Friday night, I was 12, I was mortified to tears. What had they done! Doug Karo and the Late Night Explosion have watched the full two hour show, bless them, and they have then edited the worst 5 minutes together for our enjoyment, bless them again. Meet Chewbacca’s family, listen to Carrie Fisher Sing lyrics to the Star Wars theme, and don’t forget special guest stars Art Carney, Bea Arthur and The Jefferson Star Ship! And if you really want to geek out, did you know that there are lyrics to the Buck Rogers Theme song? in 1979 the tv-series pilot had a theatrical release which included this epic intro… and I mean epic. When I was 13 I loved this song so much I bought the sound track album – which I still have. I also wanted all of the silver-space-babe outfits. Especially the bikini. *note to self, make silver space bikini. BTW: The people at www.livevideo.com won’t let me embed this video so click to link below – enjoy!